My work suggests a journey through an imagined landscape. 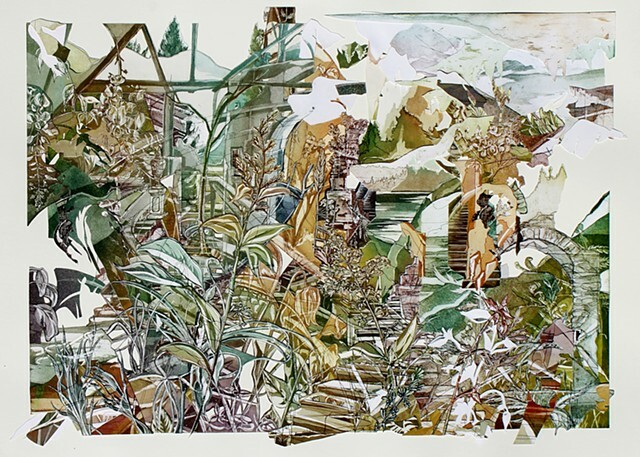 Drawing from an exploration of natural and constructed environments, I am able to create intricately woven images that are both recognizable and abstracted at once. Physically layering elements within a composition echoes the process of remembering, as images fade away and reappear, producing a dynamic web of sensory information and visual imagery. The deconstruction or pulling apart of layers becomes a form of excavation, an action that reveals glimpses of a different time and place. It is through the process of reconstruction that unique spaces are invented, materializing out of real experience, yet transforming into something entirely new. Intrigued by the various ways in which these images or mental impressions interact with one another, I use printmaking and collage to construct, deconstruct, and reassemble compositions, interrupting the natural rhythm and flow of image creation. What is represented in the imagery can be either revealed or lost in this process. There is an acknowledgement of a certain order and chaos in both content and execution, which allows for a forced distance between my working process and the finished product. The work itself becomes an artifact or trace of each stage of this investigation.